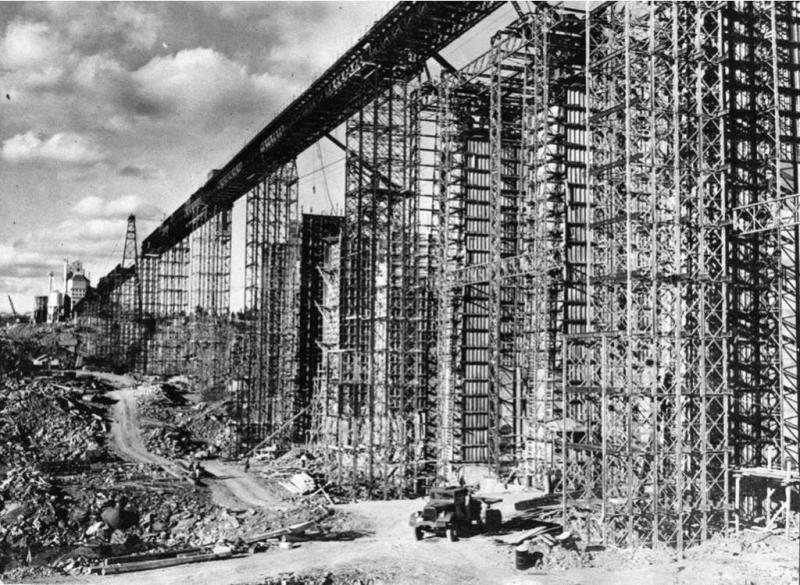 " What about this one, not that crazy but I had never seen this construction form before "
It looks pretty CRAZY to me ! I've not seen that exact construction before either. ...& 1/2 (upside-down) 'suspension-bridge' ... with the DECK on TOP ! ... until they DYNAMITED ! it. and made a Fink truss out of it. Appomattox High Bridge is another example of this German's technique. Wow, those are all cool bridges! Very interesting stuff! The 'Bailey Bridge' ... YYEESSIIRR !! ... also somehow recalling my 'Airfix' HO scale Pontoon Bridge kit of yesteryear. Designed to replace blown-up bridges for the most part, circa WWII design, I believe. Don't 'quote' me though ! ... This aint a history lesson !! Had to be simple, portable, strong etc. ... Plus quick & easy to assemble. The Army probably had specially selected crack-troops, who were good at 'Meccano' sets to do this. 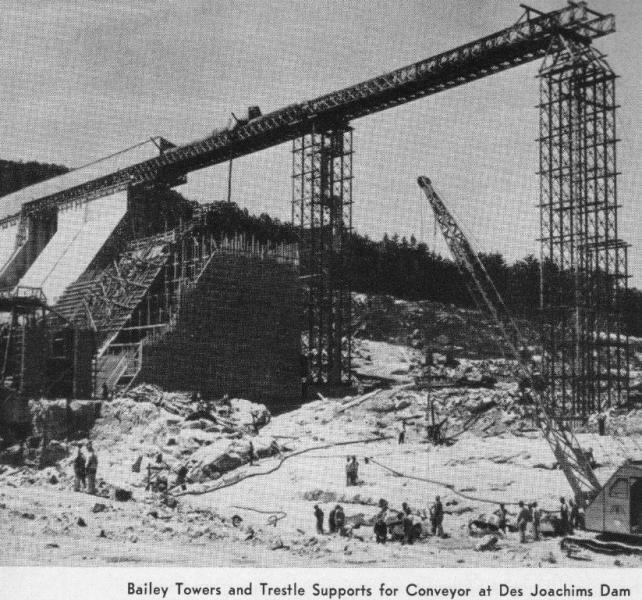 Pops was in wireless-comms, so never turned a rusty bolt on a 'Bailey Bridge' ... just a rusty dial on a radio ! If it was good for whatever reasons, it might be good for a rinky-dink mining/logging railroad as well ?
" OK ... Right Lads ! ... GET MECCANOING !! " A little expensive starting around $30 plus postage.
" Okay Si you're gonna hate me for this "
For some insane reason I hadn't even thought of searching for a 1:35 model of one ! But YES ! the 'Bronco' model does look interesting. 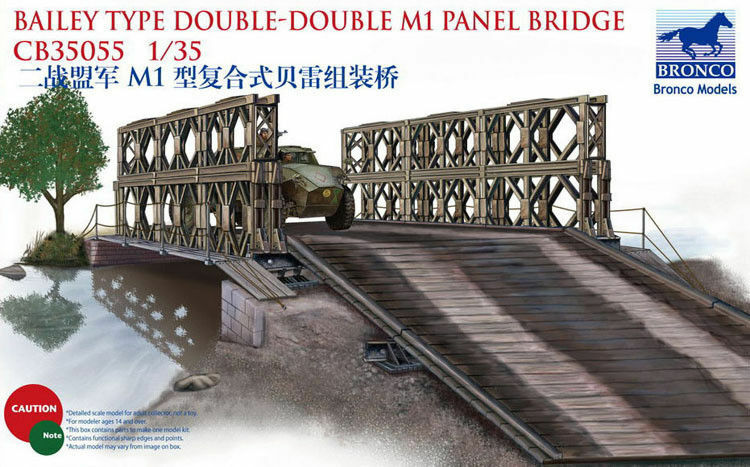 A double-decker Bailey Bridge version is available as well, Better value ? with more sprues I suppose ?? 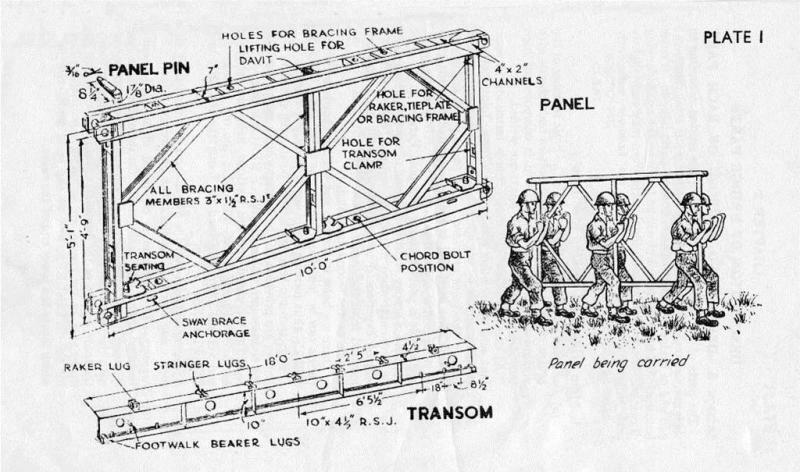 The bridge components could easily work for On30 and perhaps Gn15 bridge BASHers. What do you think Michael ? ... I know you're tempted !! It looks a bit like this bridge which is build after WW2 cause the original concrete bridge was destroyed. 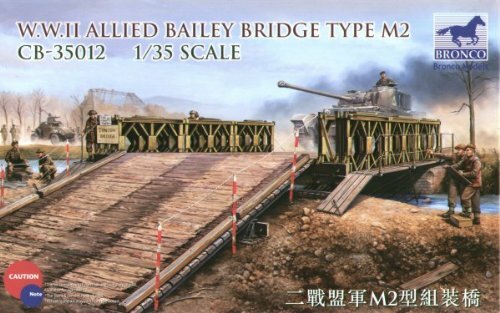 Nice Bailey Bridge you found. Not just a 5-min temporary bridge ... But built TO LAST so it seems ! 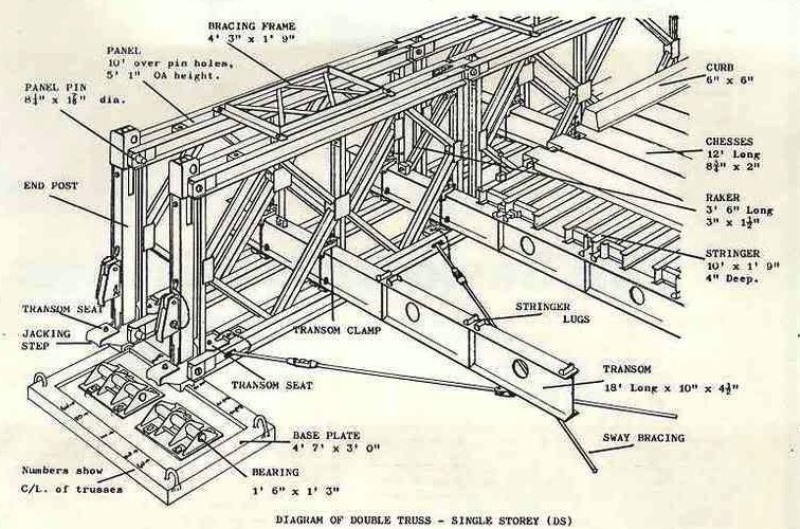 There are quite a lot of Bailey Bridge related pictures on Google Images . . .
" Well chaps ... The Top Brass at H.Q. 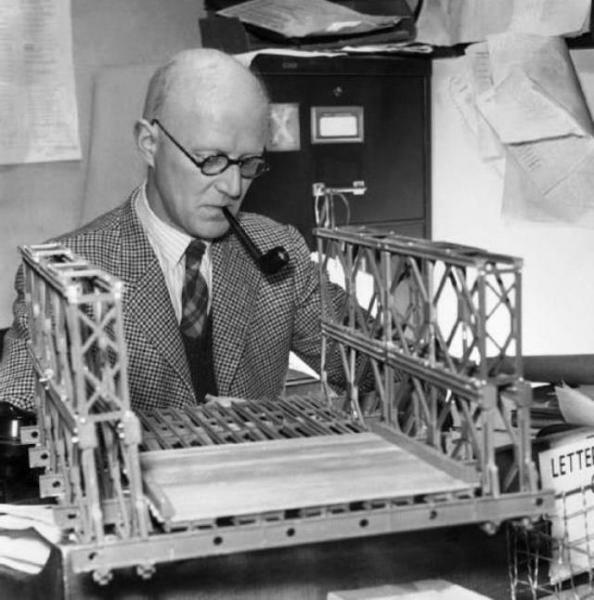 will think this is a rather spiffy bridge if I'm not entirely mistaken "
D.C.Bailey lets his pipe momentarily go out, as he curses 'Meccano' for never including enough L-brackets ! Another dam Canadian construction project ! Musta dam well run the Local Hobby Store right outta L-brackets for than one ! Not so much Bailey Bridge ... as Bailey Bloomin' BIG !! I never liked 'Meccano' much anyway ... Except for the gear-wheels of course ! think I will stick to smaller? steel bridges myself.
" Imagine walking into your LHS and ordering up a 100 kits to get started! on a project like that "
... all heavily armed ... with those tiny little Meccano spanners ! 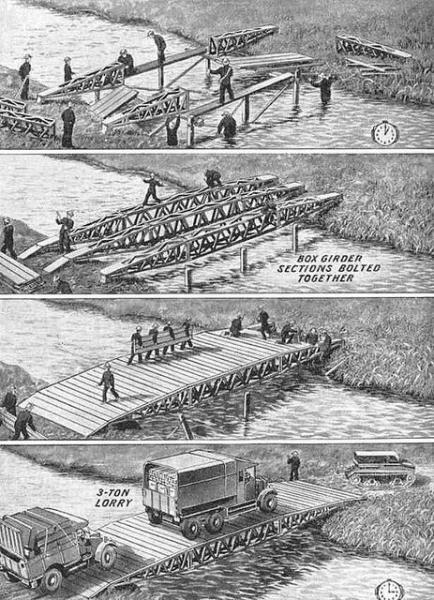 A vintage bridge laying illustration, from Google Images, titled ... 'Before The Bailey Bridge'.